The Undesign exhibit parses housing policies that contributed to segregation and income disparities. The New Orleans City Council is poised to take action on two housing policies that have major implications for New Orleans’ neighborhoods. One of them, the so-called smart housing mix, would require new residential developments over a certain size to set aside units priced within reach of average earners. The city would offset the costs of the affordable set-asides through land-use and property-tax incentives. A similar set-aside mechanism would require managers of short-term rental units in commercial areas to include units for longer-term tenants of average means. These twin policies present a golden opportunity to provide affordable homes for low-income residents in neighborhoods connected to job centers at a time when they are steadily being pushed outside the urban core due to rising housing costs. In essence, the Council is grappling with these questions: what should our neighborhoods look like and who gets to live in them? This is not the first time city officials have addressed these questions; they have been a central concern of federal, state, and local governments since the abolition of slavery. So, before the Council acts, we must take a hard look into our past and consider whether those decisions are perpetuating a history of unfair and racist practices or charting a fair course for the future. A person’s zip code – where they live – too often determines their success in life. Yet, the lines between where we live, where we see investment, and which communities prosper are not random. For too long, our zoning policies have connected only certain residents to prosperity, leaving others beneath the poverty line and below the flood line. “Hazardous populations” included not just non-whites—blacks, Hispanics, Asians—but also Jews, Italians and Polish immigrants, among others. The historical legacy of “redlining,” or systematically designating African American and immigrant communities as “high risk” or altogether off-limits for lenders and insurers, shapes our current housing and neighborhood landscape. Just below the surface of housing policy in any city in the United States is this long and troubling history of systematized racial segregation and disinvestment that has undermined fairness and deprived many communities of the resources they need to thrive. New Orleans is no different. To understand the past and change the future of fair housing, we at Enterprise Community Partners teamed with Designing the We, a design studio that seeks social impact, to create a traveling exhibition that will be in New Orleans through March. An advisory team of volunteers collected local stories and historical content to tailor the exhibit to New Orleans. 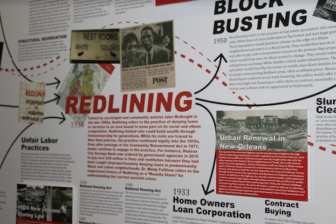 Undesign the Redline (Undesign) connects the national history of racial housing segregation to the local landscape, as well as to current political and social challenges in cities across the country. Undesign is a powerful way to engage with history, to examine how racist policies from decades ago still impact our communities today, and to inspire action toward creating communities that promote opportunity for all. Undesign’s use of historic neighborhood classification maps and pop-out exhibits provides a powerful perspective on our history retold under the shadow of redlining—a history that should inform how our lawmakers approach the proposed Smart Housing Mix Ordinance, short-term rentals, and a host of other issues. Undesign shows how land-use policy, not individual choice, has helped create racial segregation since the turn of the 19th century. The end of the Civil War and the abolition of slavery ushered in the Jim Crow era, which embedded practices that discriminated against blacks across all areas of society. Over subsequent decades, governments effectively formalized neighborhood settlement along racial lines, laying the groundwork for racial covenants and discriminatory zoning practices. Against the backdrop of Jim Crow came the New Deal and the invention of the 30-year mortgage. Expanding mortgage terms to 30 years made homeownership possible for many Americans, and the federal government further propped up homeownership by insuring home loans through the Home Owners’ Loan Corporation (HOLC). HOLC created maps to assess the credit risk of loans, coding neighborhoods red (meaning hazardous) whenever “infiltration of hazardous populations” was observed. “Hazardous populations” included not just non-whites—blacks, Hispanics, Asians—but also Jews, Italians and Polish immigrants, among others. Redlining was embedded in federal regulations dating to the 1930s. Redlining restricted the tools of homeownership to all-white neighborhoods, and incentivized whites to move out of areas that were even slightly integrated. Over time the lack of investment in redlined neighborhoods led to those areas being classified as “slums” that needed to be replaced with more “modern” and “sanitary” forms of housing and infrastructure. The upshot was “urban renewal,” which facilitated white flight and the hyper-segregation of metropolitan areas. In New Orleans, urban renewal has had profound impacts, such as removing residential blocks and commercial districts in the Tremé to make way for the elevated Interstate 10 and an ill-fated cultural center project that never materialized (eventually the site became the gated Armstrong Park). The ensuing “white flight” from cities was subsidized by investments in the federal highway system. In New Orleans, this also included draining swampland surrounding the city and expanding the streetcar line. It was underpinned by racial covenants and restricted deeds that ensured those neighborhoods farther from the urban core would remain all white. Segregation peaked in the 1970s; neighborhoods were more segregated and schools and other community and civic institutions reinforced these divisions. How do we bring investment into a redlined community, healing historic wealth destruction without creating new waves of displacement? Investment capital fled along with the white middle class and New Orleans, like many cities, was left with higher unemployment and a faltering economy. That inspired a policy of “planned shrinkage,” slashing budgets, typically for sanitation, education and the fire department. A series of epidemics—heroin, crack, HIV/AIDS, and violence—were met by a police response, leading to the era of mass incarceration. Undesign shows redlining and racial segregation as a series of consequences and reactions rippling through the history of our city, each negatively compounding the discrimination of the previous era and never addressing the deeper causes of the problems when seeking solutions. Though the Fair Housing Act of 1968 outlawed redlining, its consequences continue to plague many black and Latino neighborhoods in the form of systemic poverty. Today, low-income people of color make up 75 percent of the neighborhoods originally redlined in the 1930s, according to a new study by the National Community Reinvestment Committee. After Katrina and the levee failures, these housing disparities were laid bare. Research indicates that the storm disproportionately impacted black residents, who had been redlined into vulnerable neighborhoods. When the state developed policies to determine how much recovery funding families should receive under the Road Home program, policies that were thought to be race neutral were later determined to have discriminated against black homeowners because the grants were based on the home’s pre-storm value rather than the actual cost of repairing them. Redlining and neighborhood disinvestment guaranteed that those pre-storm values would be low. If we know where and how to look, the repercussions of redlining can be seen in our past and present disparities; but if not addressed, they will also perpetuate cultural, political, and economic divides into our future as a city. Research by the Jane Place Neighborhood Sustainability Initiative reveals that highest concentrations of short-term rentals outside of the CBD are in the working-class black neighborhoods of Central City, Tremé, the Seventh Ward, and Leonidas/Pigeon Town. Again, the history of redlining and disinvestment provides a clue as to why that is the case: the depressed value of these properties because of historical policies and actions, combined with their proximity to the French Quarter and other tourist destinations, make them a lucrative focus of short-term rental investment. In the process rents rise and long-term tenants are forced out of neighborhoods they can no longer afford. One essential question at the heart of Undesign is how to step into the future. How do we bring investment into a redlined community, healing historic wealth destruction without creating new waves of displacement? With inclusionary zoning and affordable housing requirements on short-term rentals, the city can capitalize on private investment to increase affordable housing for low and moderate-income residents in high opportunity areas. We have a choice to make with these upcoming policy decisions. 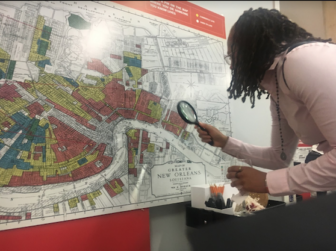 Our zoning and permitting decisions can either perpetuate a redlined city or we can undesign the redline and reshape New Orleans to create communities where every person has equitable access to opportunity, and where race and origin are not a predictor of life outcomes as they have been for so much of our history. The City Council must commit to affordable-housing requirements through the smart housing mix and short-term rental regulations to lead the way into a more equitable future. John Sullivan is Senior Program Director for State and Local Policy, Gulf Coast for Enterprise Community Partners. Enterprise is a nonprofit that improves communities and people’s lives by making well-designed homes affordable. Undesign the Redline is hosted by The Albert and Tina Small Center for Collaborative Design, located on 1725 Baronne St., and is open Monday-Friday from 10 A.M. to 5 P.M through March 1st. Enterprise received support from the Foundation for Louisiana, Greater New Orleans Foundation, Fidelity Bank, Gulf Coast Housing Partnership and Coats Rose to bring the exhibit to New Orleans. Focus should be on transit riders, not cars.